David Jones was born on 8 March 1793 in Carmarthen, South Wales, the son of farmer Thomas and his wife Nancy. He married Catherine Hughes (d.1814) in Eglwyswrw, Pembrokeshire in 1813. She died the following year and he married his second wife Jane, the daughter of John Hall Mander, in London in 1828. They had four sons and four daughters. He died on 29 March 1873 at Lyon Terrace, Hyde Park. His widow died three weeks later. He was buried at Devonshire Street Cemetery. Apprenticed to a grocer at 15, Jones was working in London in 1814. He entered a partnership with the Australian Charles Appleton and came to Sydney on the Medway from Hobart in September 1835, where he managed the mercantile firm Appleton & Jones. The partnership was dissolved in 1838 when he established Davis Jones & Co, general drapers, at 463 George Street, also his residence. 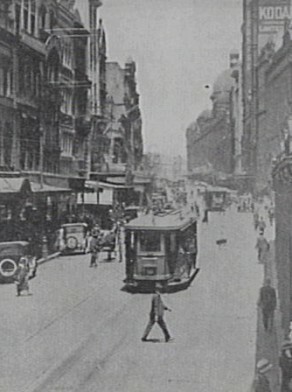 By 1849, David Jones & Co had leased the Jerusalem Warehouse on the corner of Barrack and George streets from James Simmons and converted it into a two-storey shop. The firm prospered and Jones retired from active management in 1856 but returned to salvage the firm from bankruptcy. The business passed to his fourth son Edward Lloyd Jones and then to his son Sir Charles Lloyd Jones. His great-grandson David Lloyd Jones (1931-61) was a City Alderman from 1931 to 1961. Jones lived for some time at Forest Lodge (also home to Alderman Ambrose Foss). In 1859, he had a private residence at Barncleuth, Macleay Street and later lived at 5 Lyons Terrace, Liverpool Street. He invested in banks, steamships, insurance, building and other companies. In 1857 he had three squatting runs in the Wide Bay and Burnett Districts. He visited England and Wales in 1849. David Jones was the Director of the Mutual Fire Insurance Company in 1840 and the Foundation Director of AMP in 1848. He was Trustee and Chairman of Metropolitan and Counties Permanent and Investment Society in 1851. He gave 1000 guineas to the Crimean War victims’ fund. He was a founder and councillor of Camden College and a committee member of the New South Wales Auxiliary to the British and Foreign Bible Society and Australian Religious Tract Society. A “Christian merchant”, he was the Senior Deacon at Pitt Street Congregation Church for 35 years. Like Alderman Ambrose Foss, he was a prominent member of Glebe Congregational Church. David Jones was a member of the New South Wales Legislative Council, from 22 May 1856 to 29 March 1860. David Jones was a Foundation Councillor for Cook Ward, 1 November 1842 until his retirement on 31 October 1844. G. P. Walsh, ‘Jones, David (1793–1873)’, Australian Dictionary of Biography, National Centre of Biography, Australian National University, http://adb.anu.edu.au/biography/jones-david-2279/text2929, accessed 7 January 2013.